Unless you are a supermodel, chances are your business travel will take you to destinations beyond New York, LA, London and Milan, yet most travel apps focus only on mega-metropolises. But what if you’re like the rest of us and business travels steers you to places like Madison, Lubbock, and Fayetteville? These locales won’t pop up on popular travel apps like Peek, Viator, or Fodor, but with a few handy apps, you can let your phone light the way to some good eats, postcard-worthy sites and other local charms. AroundMe: For those of us who start the day incapacitated until we get coffee in our system, traveling can pose some real struggles. Where are we going to get our morning fix? 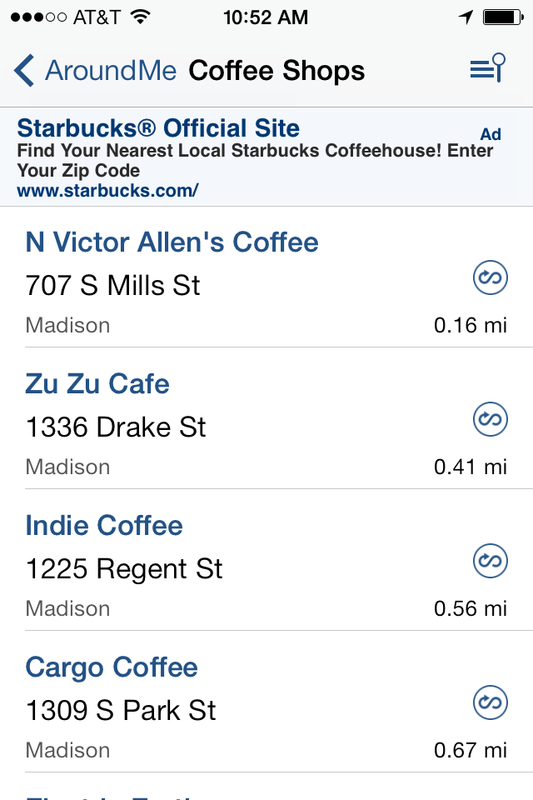 Don’t fret: AroundMe makes it easy to find the closest coffee shop, pronto. Or a gas station if you’ve hit rock bottom and are willing to drink day-old sludge — we’ve been there. The app can also steer you to banks, hospitals, and pharmacies if you have emergencies bigger than caffeine-deprivation. Urbanspoon: To many business travelers, one of the perks of time on the road is dining out on the company’s dime. Urbanspoon helps you quickly vet restaurants to find exactly what you are looking for. Or if you are feeling adventurous, you can use their “Shake” feature – add a few inputs, and give your phone a shake. Check out the recommendations and eat up. Get reviews from other diners as well as food critics. Postcard on the Run: Being far from family is an unfortunate reality of business travel. Stay close and send real physical postcards sent straight from your smart phone. Use your own pictures to make it personal. The possibilities are endless: cheer up grandma with a postcard featuring your beautiful mug, send your kiddos unique post cards from every city you visit, rub it in your coworker’s face when you are on vacation (you can add sunscreen scratch-n-sniff for only $0.50). Let your family and friends know that you are thinking of them, wherever your travels take you. TripAdvisor: Take a trip from good-to-great with this amazing app. 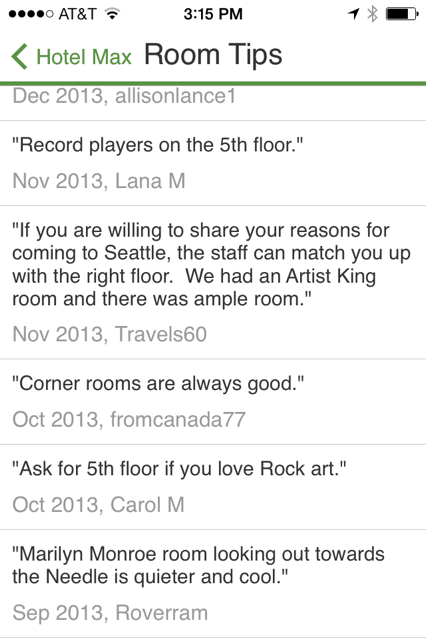 Pull your hotel up on the app and check out the “Room Tips” section. Get the inside scoop from travelers so that you can get the best possible room. Make your requests at check-in:. “Do you have any rooms on the 5th floor? I read on TripAdvisor that there are record players.” Not only do you have a better chance of getting the best rooms, but you also are letting the hotel know you are a TripAdvisor user, and are more likely to share your good experience with others. Next time you hit the road, pack your cell phone charger and start exploring.